Built by Bethlehem Steel Corporation in San Pedro, California, and commissioned on December 31, 1943, the USS Cassin Young (DD-793) was at the forefront of the naval offensive against the Japanese during World War II. The USS Cassin Young, a destroyer of the Fletcher-class, measures 376 feet in length and 40 feet in width, and carried 273 crew members during wartime. Destroyers were first built in the early 20th century in response to the development of small, fast torpedo boats designed to attack and sink larger battleships and cruisers. As a counter against torpedo boats, navies built destroyers, which were larger ships armed with torpedoes and heavier guns. Destroyers were prepared to fight off attacks from the air, on the surface or from below the water. Fletcher-class destroyers were considered the best destroyers of the period, and 175 of these ships were built between 1941 and 1945. The USS Cassin Young was named after U.S. Navy Captain Cassin Young, who received the Medal of Honor for bravery during the attack on Pearl Harbor and died in the Naval Battle of Guadalcanal on November 13, 1942. The USS Cassin Young served with distinction in the Pacific during the war and participated extensively in the Okinawa campaign where two Kamikaze attacks struck the vessel. The USS Cassin Young underwent repairs in California and was subsequently decommissioned in 1946. 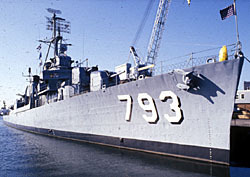 Recalled into service at the outbreak of the Korean War, the vessel served until 1960 when it was again decommissioned. During this period, USS Cassin Young was modernized several times by the Boston Naval Shipyard. 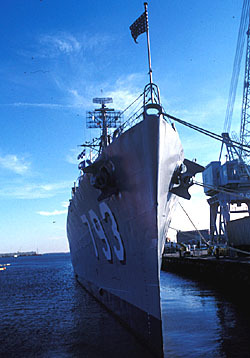 Since 1981, USS Cassin Young has been open to the public and serves as an example of the type of ship built, repaired and modernized at the shipyard. The USS Cassin Young was designated a National Historic Landmark in 1986 and retains much of its World War II integrity. USS Cassin Young, a National Historic Landmark administered by the National Park Service, is located at Pier 1 in Boston Naval ShipYard, (Boston National Historical Park) on the south side of Chelsea St. in the Chalrestown area of Boston. Tours of the ship are available daily April-November from 10:00am to 4:00pm, and December-March on a more limited basis. For further information on tour schedules, call 617-242-5601 or visit the ship's website.